The first installment of the monster advancement-series clocks in at 17 pages, 1 page front cover, 1 page editorial, 2 pages of SRD, leaving us with 13 pages of content, so let’s take a look, shall we? So what do we have here? 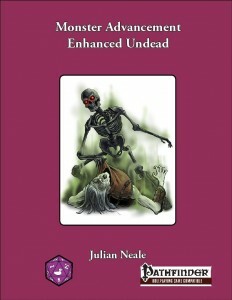 Essentially, this pdf provides one expanded, massive, extremely customizable templatey toolkit to enhance undead (d’uh), but with a focus of skeletal champions and zombie lords, thematically – so no, VtM-fans, you won’t find a huge array of vampiric powers in here, though the modifications within this book are generic enough to be applicable to just about any undead – the primary focus (and thus mechanical execution) simply is different. Basically, the template provides one special quality per 3 points of CR, though capable GMs should have no issue playing with the pretty simple base mechanics. At the same time, though, novices are not left in the proverbial dark with the undead: Instead, what we have here, is a concise depiction of the thought-process behind the undead – from researching special abilities to an actually concise explanation of DR-enhancement (and any designer who tried to write one of those will appreciate the effort! ), the explanations are nice indeed. Now as for the content provided, we actually go one step beyond what one would expect – with e.g. support for Pact magic by Radiance House Press, we can see an example of commendable 3pp-camraderie. Beyond this instance, though, we have more than basic augmentations: Necrotic pustules for plagued undead, disease-causing breaths, auras of despair, soul devouring, ability drain – you name the basic, nasty tricks and they’re here. However, even beyond these, especially GMs in horror-themed campaigns (or those of you fed up with certain tactics) will cackle with glee upon reading of undead that can temporarily shut down divine casting, those that act as dimensional anchors or negative energy breath weapons. Speaking of which: Julian Neale is one of the few designers I know who is *VERY MUCH* into the nit and grit of math – so much so that his designs tend to look less impressive than they actually are in gameplay: Here, though, this predilection works exceedingly in his favor – if you’re going for a breath weapon, you’ll have a massive table for each CR from 3 to 20, sporting 3 entries – one with smoothed and pretty continuous output, one that is swingy and, if that’s how you roll (or rather, not roll), one containing damage averages. That is above and beyond of what I expected – kudos for going the extra mile! With Kyuss-style vermin-mastery, better undead control, gaze attacks, object-ruining claws, desecrate auras, telekinesis, flawless two-weapon fighting and a significant and upgradeable array of SPs, the undead herein can be made truly deadly and versatile. Following a design-tenet near and dear to my heart that rewards players for their legwork, flaws are presented as optional modifications, as are specific armors. Skill bonuses and subtype-acquisition are listed as further means of modification. Beyond simply providing this massive toolkit and leaving you alone with it, advice on actually using it is provided – as are 6 sample undead, including a lamia juju zombie inquisitor or a mummy cleric. Editing and formatting, while not perfect, can still be considered pretty good. Layout adheres to Purple Duck games’ printer-friendly 2-column b/w-standard and the pdf has no artworks apart from the cover, but ultimately needs none. The pdf comes fully and extensively bookmarked for your convenience. Julian Neale, as mentioned above, is a designer who quite frankly should see more exposure – his humble and often intriguing designs, with their unpretentious subtlety can be pretty much a joy to read, especially when tackling monsters etc. This pdf, then, plays his strengths perfectly – what we have here is basically a nice, complex toolkit that blends basic and more complex options and allows a GM to quickly and efficiently customize the undead that his players have destroyed time and again and bring the fear of them back. As far as I’m concerned, I thoroughly enjoyed this toolkit and consider it definitely superior to simply slapping a bland “advanced” template on a creature – this kit changes tactics, and often in a rather crucial manner. Every fan of the undead and horror GMs in particular should take a look at this. While you won’t find inspiring fluff herein, the toolkit and its rules very much make for a fun addition that *will* keep the players on their toes. My final verdict will clock in at 5 stars + seal of approval. You can get this nice toolkit here on OBS and here on d20pfsrd.com’s shop!